You were close. 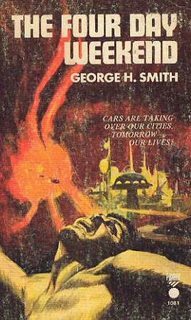 The Four Day Weekend (ISFDB) by George H. Smith. Found by searching on ISFDB for titles with "weekend" and looking for 1960s books. It was impossible, of course, because the machines had been ruling everything for 100 years, so what could they revolt against? They decided people had outlived their usefulness to them, and that genocide of 4 billion people on Planet Earth was the best policy.